This woman is so accurate it's frightening! To picky judgmental Virgos this guy will probably seem stuffy, pretentious, or like a fake, but trust me he's wonderful and he's a kind soul, check him out on youtube, Facebook, and on his website for almost daily news on what this crazy universe is up to! and has a really deep understanding of the human psyche! Here is your song for the month- or rest of the month that is, I hope everyone approves of this new way of doing the horoscopes until I can get Sancho back on the job again! 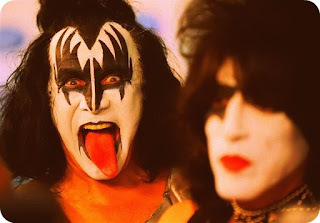 Gene Simmons is a Virgo...hard to believe huh?